To use this excellent product from the gourmet company, simply insert tube of gel into the proper position, and squeeze the trigger. Dispensing the right amount of bait gel has never been easier! This effective bait gun will dispense the correct amount every time with no mess and leaving no dripping tubes ! 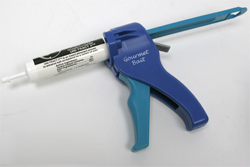 Gourmet Bait Gel Gun is used by all the pros. Includes bait gun only. Bait shown is Gourmet Ant Gel 30 gram. Gel baits are sold separately (see below for examples).